Unifor President Jerry Dias says Unifor and the UAW in the United States are a lot stronger together when dealing with issues like General Motors. 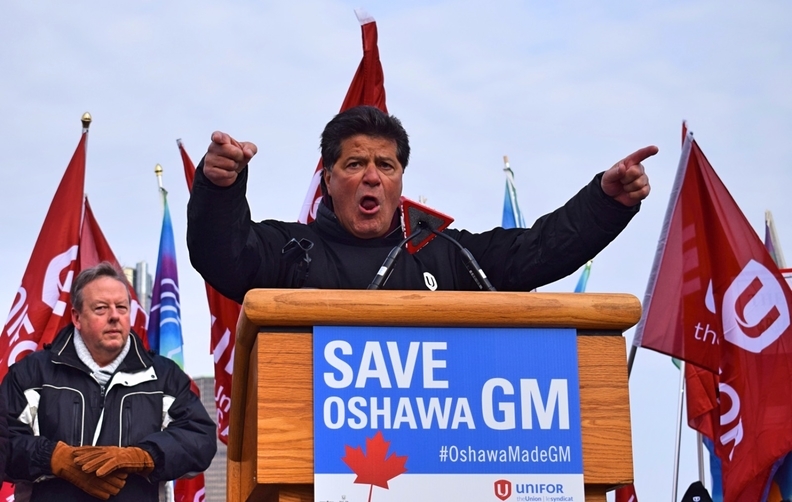 Unifor President Jerry Dias expects his union and the UAW in the United States to “work better together” in their campaigns against General Motors’ manufacturing plans, he said Thursday following a meeting with UAW leadership in Detroit. Dias met with UAW President Gary Jones and UAW-GM Vice President Terry Dittes for about 90 minutes, following a Wednesday night dinner. Dias said much of the conversation focused on how the unions could cooperate in their campaigns to save five North American plants GM plans to stop allocating production to by year’s end. Oshawa Assembly northeast of Toronto, Lordstown Assembly in Ohio and Hamtramck Assembly in Michigan, as well as powertrain plants in Warren, Mich., and Baltimore, are in the automaker’s crosshairs. Oshawa is scheduled to be closed for good at the end of 2019. Dias would not divulge the specifics of the conversation. The meeting came shortly after both sides ramped up their efforts against GM. Unifor has undertaken a major media campaign that recently included a Super Bowl ad GM sought to keep from airing, and it has called for a boycott of all Mexico-made GM products. The UAW, meanwhile, has stepped up its social media campaign and urged members to not buy the new Chevrolet Blazer crossover that’s assembled in Mexico. Their campaigns are aimed at getting GM to reverse course on its manufacturing plans, part of a larger corporate restructuring the automaker said will result in $6 billion in cash savings. GM said it would stop allocating production to its Hamtramck, Mich., and Lordstown, Ohio, assembly plants, as well as powertrain plants in Michigan and Maryland. It also plans to shutter Oshawa Assembly in Ontario by the end of 2019. In a joint statement, Jones and Dias said the conversation focused on “International Trade, International Unions and common issues related to our unions,” according to a joint statement from the unions. Cooperation between the two unions would be a significant development in the fight between GM and organized labour, as the two unions have thus far waged largely separate campaigns. The unions have a complicated history: The UAW represented workers at Canadian assembly plants until 1985, when the Canadian Auto Workers split from the UAW. The CAW would merge with the Communications, Energy and Paperworkers Union of Canada in 2013 to form Unifor. Dias characterized the UAW meeting as a “good discussion” and a chance for him to get to know Jones better. Jones was elected president of the UAW in June.